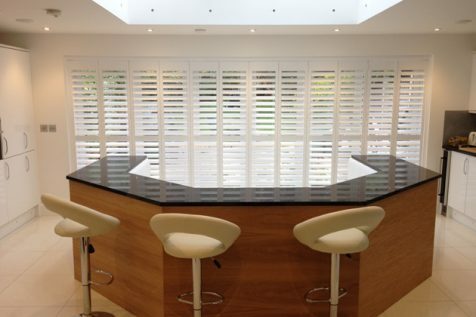 Track system shutters are fantastic anywhere in your home where a long run of shutters is needed. They’re particularly popular as room dividers, patio door covers and fitments for walk-in wardrobes. Our By-Pass and Bi-Fold systems offer two distinct sets of functional benefits for different uses. We’ll advise you on all the technical aspects when we discuss your project with you. For now, be assured that our expertly-made track system shutters will look incredible, perform perfectly and achieve the desired outcome for your home. 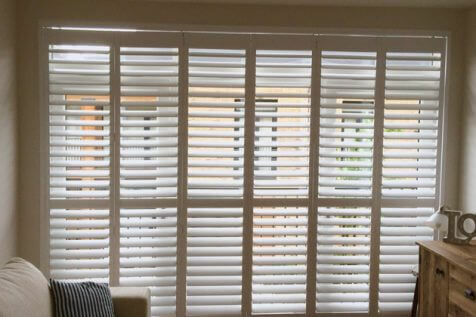 Our track mounted shutters are perfect for wide openings, wide windows and other areas of the home that require a run of shutters. This fitting of shutters hang from aluminium tracks instead of being hinged on each side. This allows for proper support of all shutters and also allows then to open correctly and with ease. The track we install is in most cases placed at the top of the window or door recess with the shutters using small wheels which run along the inside of the track to move side to side. 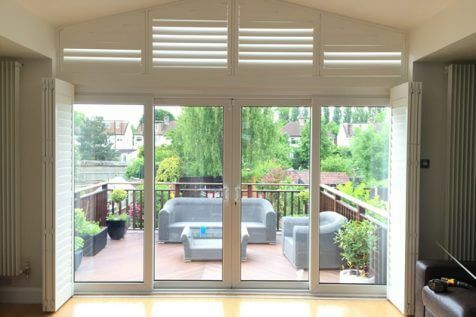 The shutters can be designed to fold to the left or right sides or can be split centrally folding to each side. As these shutters hang from a top mounted track the style of shutters that cannot use this method of mounting is tier-on-tier. Many of our customers who have patio door opening or wide windows come to us for a solution and we are happy to demonstrate the benefits of our track system. 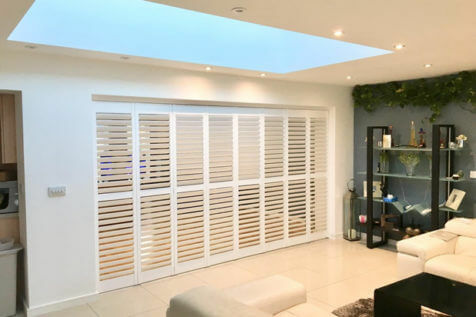 We can also fit these shutters as a great looking room divider, in-between rooms including openings and squared archways. It is crucial that you have this kind of shutters professional installed as the complexity requires high accuracy to make sure that they run smoothly at all times. When the shutters fold back you will see that they fold in on themselves at a 90 degree angle to leave plenty of room to see from the window or access the area behind. This is great for light and airflow leaving great open space when pulled all the way back. When closed clients can take advantage of the great privacy that shutters also offer. This style of shutters is available in two main types called By-Pass and Bi-Fold.